Sound City is a feature length documentary, directed by Dave Grohl (Nirvana, Foo Fighters), about the human element of music, the lost art of analogue recording, and the history of America’s greatest unsung recording studio, Sound City. Deep in the sun burnt San Fernando Valley, tucked away behind the train tracks and dilapidated warehouses, it was home to countless legends, capturing their magic on two-inch tape, decade after decade. It was witness to history. It was rock and roll hallowed ground. And it was our best-kept secret. Sound City was state-of-the-art when it opened in 1969. It soon became known for churning out one rock and roll classic after another. Featuring a legendary, one-of-a-kind Neve recording console, and arguably the best tracking room in America, many of the seminal albums of the ‘70’s, ‘80’s and ‘90’s were put on tape within these walls: Classics by Fleetwood Mac, Neil Young, Tom Petty, Metallica, Nirvana... The list is staggering. As technology advanced, and digital equipment infiltrated the recording process, Sound City became a lonely analogue outpost in a world of computers. Soon, in the age of Pro Tools, with auto-tuning and copy and paste, anyone could make music without even knowing how to play an instrument. The human element was no longer necessary. Technology not only levelled the playing field, it also changed the game. Studios all over the world began to close their doors. Sadly, Sound City was no exception. Through interviews with the legendary musicians and producers who've worked at Sound City Studios over the years, Sound City tries to uncover and define the intangible magic within those wires and walls that was responsible for such an incredible history of music, while focusing on the real human experience and craft of analogue recording by capturing epic performances of historic, full circle musical reunions. The film is also a personal journey for Dave. In the spring of 1991, as a 22 year old starving musician without a cent to his name or a place to call home, he packed all of his belongings into an old army duffle bag, threw them into the back of an old Ford van, and headed down to Sound City to make Nirvana's classic album Nevermind with his band mates Kurt Cobain and Krist Novoselic. The next 16 days not only changed the course of rock music forever, it changed his life forever. Now it's time for Dave to give something back. He's invited many of the greatest recording artists to ever grace Sound City’s halls to help him make a new album on that legendary Neve console - which he purchased when Sound City closed its doors. Together, we see them explore the human element of making music and the lost art of analogue recording. 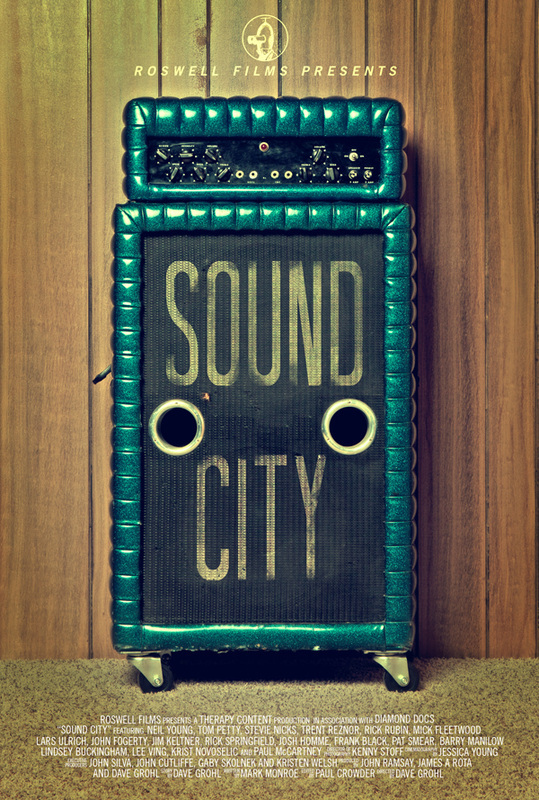 Sound City will be screened FOR ONE NIGHT ONLY at select cinemas on Thursday 31 January.